Modern Bistrot Galvin HOP are shaking things up this September with weekend events and menus to suit all tastes. Every Friday evening starting 14 September, HOP Vinyl Nights will see a guest DJ take to the decks from 10-6pm. Chairman Kato is the first musical master to take up a month-long residency at Galvin HOP, and will provide guests with lively, up-tempo variety of music, all played with vinyl. To kick-start the evening guests can take advantage of Galvin HOP’s Aperitivo Hour, where from 5-7pm diners can grab an Aperol Spritz, Campari Negroni, or O’ndina Gin & Toni plus one small plate for £9.50. Chorizo croquette with saffron aioli, Welsh rarebit with marmite toast, and spicy crunchy corn are only some of the tasty plates on offer on the new menu for guests to nibble on whilst enjoying the evening’s entertainment. A variety of thirst-quenching drinks are abundant at HOP with speciality Pilsner Urquell tapped by qualified ‘tapsters’, ensuring that customers receive the perfect pour. A variety of canned craft beers are now available from London breweries such as Truman’s and Beavertown. For wine lovers, wine is served by the bottle, glass, or on tap from HOP’s intelligent wine tanks. 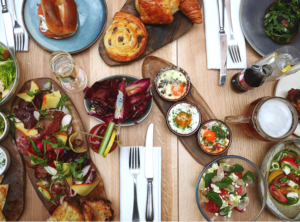 For the brunch crowd, HOP has reinvented their menu to offer diners great value on breakfast classics, which kicks off this Saturday, 15 September. To start, eggs come in all forms including an interesting combination of baked eggs, traditional benedicts, and eggs on crispy toasted sourdough. For those with a bigger appetite, tuck into a Flat Iron steak complete with Béarnaise sauce and French fries. If guests fancy listening to their favourite tunes during brunch, HOP have introduced ‘Bring Your Own Vinyl’ on Saturdays and Sundays. With breakfasts starting at £5, any cocktails on the menu for £8.50 and Pilsner Urquell at £5, HOP is setting the perfect scene for a long and leisurely morning out. Whether it’s a fun Friday night or a relaxed weekend brunch, Galvin HOP has a menu and event to suit all Londoners. This past summer the much-loved Galvin HOP in Spitalfields underwent a face-lift to reveal a brighter, funkier and more relaxed environment where customers can dine on the new Modern British inspired menu.